A link to an index of all tramways in Worcestershire can be found at the bottom of this page. Horse drawn trams first took to the streets of the City of Worcester in 1881 with a small network of routes radiating from the city centre. One line crossed over the River Severn to terminate in St.Johns whilst another went to Shrub Hill railway station and a third went along Foregate Street to the Ombersley Road. 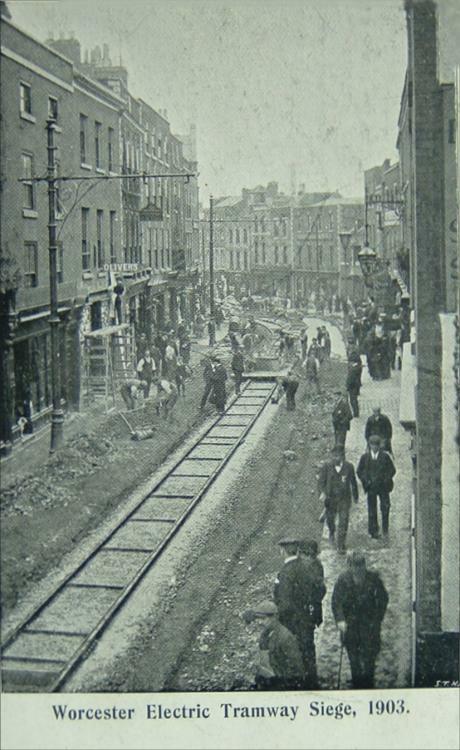 It is believed that the gauge of these tramways was 3'. 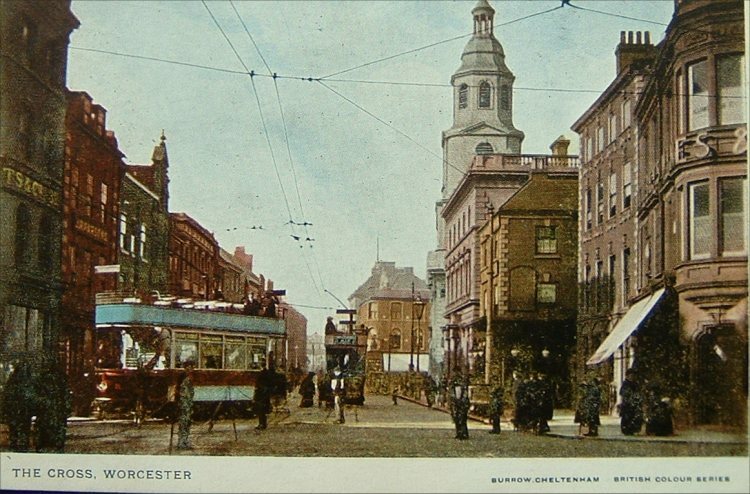 The tramways passed through a succession of owners including Worcester Tramways Ltd. (registered 1893) and Worcester Electric Traction Co. Ltd (registered 1902) who gained approval to electrify the system and what became known as 'The Siege of Worcester' took place in 1903/4. All of the images about trams on these pages are from postcards that form part of the archives of the Malvern Industrial Archaeology Circle. 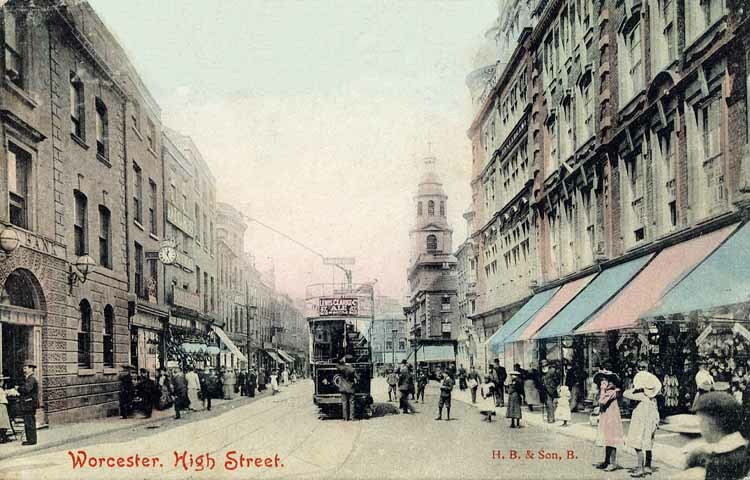 The postcard graphically illustrates the problems in Broad Street that shoppers and others had to put up with whilst the original 3' gauge tram track was torn up and replaced by the new 3'6" gauge tracks for the electric vehicles. The City Council can surely not have appreciated the sheer scale of the problems that the approval for electrification would bring to the city. The roads started to be dug up in the summer of 1903 and disruption continued until the end of the year. The new system eventually opening to the public on 6th February 1904. There are at least 15 similar postcards in the same series that depict similar scene in other streets. This postcard by the well known local publisher, Burrow of Cheltenham is taken at The Cross where the tracks curved sharply at the entrance to Broad Street. Two of the fleet of double deck trams are seen - one going in each direction on the double track. 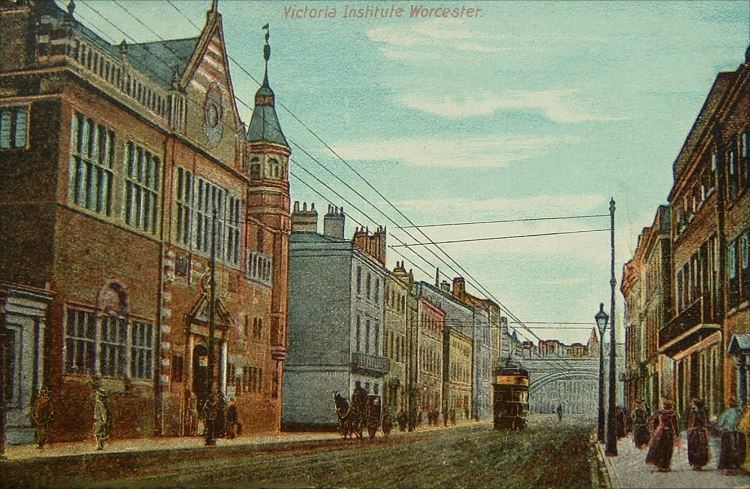 This is looking east along Foregate Street with the Victoria Institute building on the left hand side. Behind the tram is the railway bridge that carries the Worcester and Hereford Railway. This is Tram No.10 just entering a single track section in Broad Street. This is Tram No.13 in the High Street in Worcester. The scene would appear to have been setup for the photographer as can be observed by the obviously posed position of the onlookers. This a busy street scene further along the High Street. The building on the left hand side is the Guild Hall that has changed little in appearance from then until the present day. There is an excellent restaurant that is open to the public on the second floor of the Guild Hall. 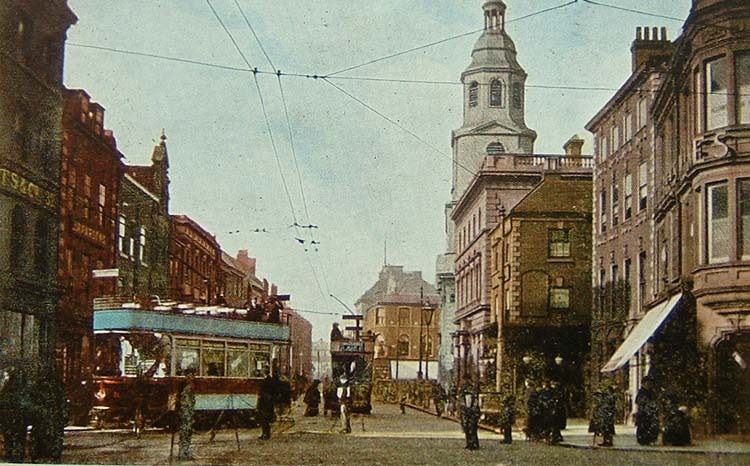 A pair of trams meet at The Cross. This photograph was taken about 1904. The church is St Swithin's church. 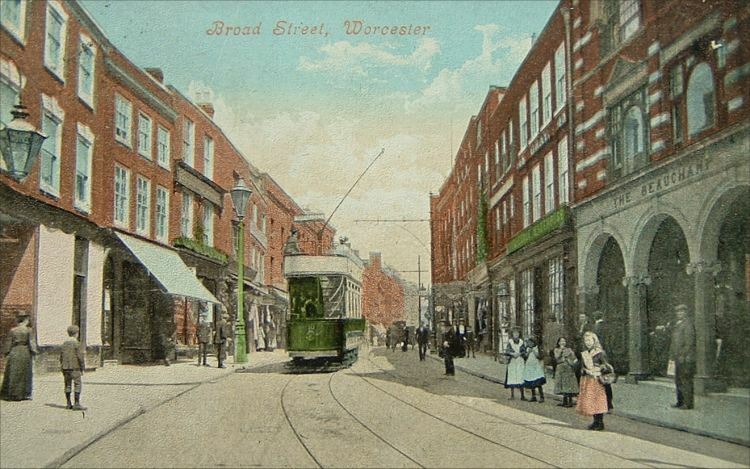 This is another earlier postcard of a tram in High Street, Worcester. This is tram No.4 with an advert on the front for Lewis Clarke & Co who sold ale for 2/3d a bottle. This postcard was posted on July 9th 1906. 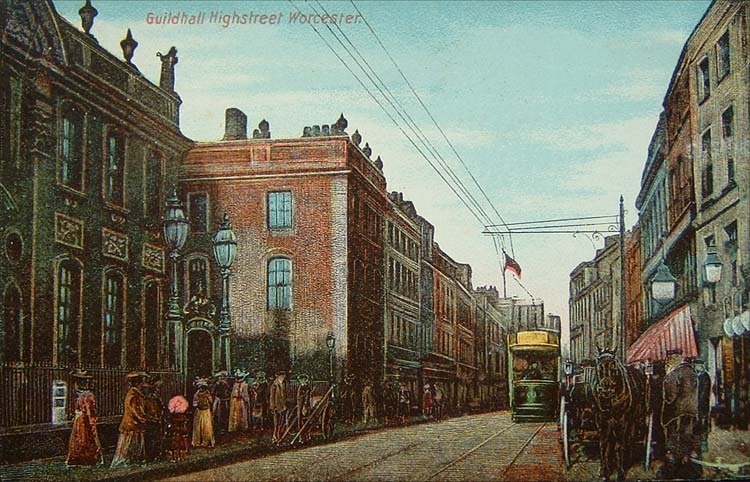 Although successful as a means of transport, the lack of flexibility of operation led to the early replacement of the entire system by buses as early as 1928 when the 'second siege of Worcester' took place as the tram tracks were torn up. The Worcester Electric Traction Co. Ltd. was put into voluntary liquidation on 17th September 1934 and the whole undertaking acquired by Worcester Corporation. Download in pdf format showing the location and details of Tram Depots in the County, kindly supplied by Roger Lamb.